Minnesota recount: What do the ballots tell us? We’re all having a great time playing election judge with the challenged ballots coming out of the various counties. However, while it is amusing, the ballots raise a lot of interesting questions. First, it should be noted that these are just a small fraction of the ballots being recounted and challenged. Looking at the data from yesterday, 452,249 were recounted. Of those, 221 were challenged, which equated to about 0.000489 0.0487 percent (thanks MNLatteLiberal for the correction). See where I’m going with this? These ballots are certainly not representative of everyone that voted. For the most part, people voted correctly. Whether it be from years of standardized testing or simply reading the instructions at the top of the ballot (click image to see instructions). However, if you assume that there will be 200+ challenges a day similar to these, that starts to add up to a lot of incorrectly filled out ballots. So should there be more explicit instructions, not only on the ballot but at the polling places? Not everyone is familiar with scantron-style bubble tests. What we’ve also been wondering is if these people knew that they could ask for another ballot if they feel they messed it up. The prevalence of arrows, eraser marks and lines show that people made mistakes. Is it embarassing to ask for another ballot? None of these questions can be answered without knowing exactly what the person was thinking about when they voted, whether it be lizard people or just sheer confusion. What was the scene at your polling place? Was it far too busy, chaotic or confusing to ask for another ballot if you made a mistake or ask for instructions if you were confused at how to fill out the ballots? Were there not enough poll workers to help out? The other topic these ballots obviously bring up is the ballot system in general. Does this make the case for an all-electronic voting system in Minnesota? I’ll let you weigh in on that. Do these challenged ballots make the case for electronic voting? With paper ballots at least we know which people have problems understanding and completing the ballots. Understanding and completing the online ballot is at least as difficult. However we would have no idea how incompetent the voters are and their votes would be counted incorrectly. At least with paper, some of the votes are invalidated. I did have to ask for another ballot. The pen was very fresh and it touched the paper where I didn’t want it to. Luckily, I went at 3:00 PM and was one of three people voting at that time. The put my ballot into an envelope of spoiled ballots and gave me a fresh one. No problem. Electronic voting will not cure these issues. Stupid people will always find ways to surprise us. This message brought to you by the committee to elect lizard people, this message should not be considered to support any human or human party. What is shows me is the optical scanners could use some improvements too. Voting for more than one should be an automatic rejection. I am a stickler really. I don’t buy into voter intent. It is not right reject it. How does one determine someone else’ intent, you don’t, and shouldn’t have too. There will always be people who fail to follow the instructions for voting. The law is the law, and although innocent mistakes can be excused, not-so-innocent mistakes can’t. Ballots should be so marked, or instructions within a voting booth that are obvious to a voter should be placed in plain sight. Such instructions should include: Do not scribble on, draw on, place a number on, or in any way sign the ballot. Do not allow your pencil or pen to make marks to another circle. If you choose the wrong candidate, then return this ballot for a new one — DO NOT ERASE, as we might recognize an erasure as an attempt to vote. I was pulling that number from our results that we got from the Secretary of State’s Office. You are, however, absolutely correct. Coding error didn’t multiply result by 100 for proper percentage. Fixing now. Absolutely NOT – Have you not heard about Diebold completely throwing the last election?? In Ohio and Florida, I would never trust electronic voting. Never. Electronic voting? Investigate before you advocate!!! Google Brad Freedman’s Bradblog and learn just how hackable and corruptible electronic voting. especially touch-screen voting, really is. We could and should vote on paper ballots the way they do in Australia, Canada, and many other perfectly modern and throughly democratic (small d) countries do. ANY system is vulnerable to human errors or to stupidity—but with paper ballots you have actual evidence to examine. With black-box voting, which ought to be called “faith-based” voting, the system is inherently untrustworthy. Journalists are the laziest and most intellectually incurious category of so-called professionals I have ever known. The refusal to critically study the electronic-voting scam is a blot on the Fourth Estate. We are asked to judge people’s intent everyday, in jury trials. If we don’t have a problem with the task in one context, I don’t think we should have a problem in the other. Just my 2 cents. The answer is to have as good design as possible for the ballots, and keep them on paper. The electronic machines pose too many problems. MN has a pretty good system, with random audits, and moves to more and more accurate counting techniques as necessary. I would suggest better standardization on the ballot tabulators, along with more random audits to keep everybody honest. No, because the current optical system is substantially more secure, accurate, verifiable, and auditable than a computerized voting terminal. I settled for ‘No, …’, but the question as phrased is bordering on propaganda. The scanners can be probably be improved to catch more mistakes that lead to questioned ballots, but touch computerized systems have much worse problems. Every system has flaws. Your question only makes sense if you assume electronic voting is perfect, or at least less flawed than paper+optical scan. Yet the studies I’ve seen indicate that optical scan has the lowest error rates of any auditable system. So… WTF? False dichotomy, anyone? If Barack has to give up his Blackberry, the least we can do is give up trying to vote with touchscreen machines – paper trail or no. As for the ballots, I don’t know quite what to make of some of the errors. There’s a statement about voter indecision buried in them, but it seems also a statement about either poor voter preparation (both in deciding and in getting informed about the process) or about the plain inability of a rather large percentage of the population to comprehend and follow instructions. Clearly if the booth doesn’t include a notice in large print of the availability of fresh ballots, your average voter is not going to come out and go looking to find out whether such an option exists. Certainly where I live there is no such clear posting. Perhaps that alone would have eliminated another 10th of a percent of confused ballots. We can laugh at voter failures, but it’s now 8 years since our first Presidential election breakdown. Any sensible society would have straightened these things out by now. I think we should keep the system the way it is, but add more visual instructions. I work in a manufacturing facility with many immigrants and we continually work on ways to improve instructions. Large posters with the right example and most common wrong (the universal red circle with line through it) examples could be located on the wall where people register and get their ballot. The best way to correct the problem would be to (1) do away with secret balloting alltogether and require that each voter sign the ballot with his/her name and social security number and (2) that all the votes be published in a catalogue so that all voters could se that no votes were myseriously “lost” during the election. Also this would require some backbone – that the voters really stand up for their choice – if you don’t stand up for your opinion, then why should your opinion be respected? If nothing else this would reduce pork spending because a voter cannot publically lament pork and claim to be supporting a reform candidate while at the same time secretly voting with the wallet in mind for a pork baron. Keep the scanned paper ballots — they have many advantages over alternatives like touchscreen systems. But the ballot design could be improved, as demonstrated in this interactive graphic by the NY Times (25-Aug-2008). I think the problem isn’t with paper ballots in general but with this one in particular. It’s like the old kind of tests you had to fill out in grammer school. I think it’s a lousy method. Surely there must be a better way to design a paper ballot. Actually, what mndasher proposes is perfectly compatible with our system of jury trials. In a trial, there is a default judgement – not guilty. mndasher is applying the same principle to voting – the default is no vote. All voters have the opportunity to examine their ballots for errors, and it is the responsibility of each individual to follow the instructions for properly completing the ballot. These examples seem to provide all the evidence that people will do all manner of unexpected things, irrespective of the clarity of the instructions. Just think if these voters’ efforts were in no way reviewable in a race this close. Electronic systems would have no paper trail to check, either before they cast their ballot, or after. 1. Electronic voting does not eliminate people from making mistakes. 2. Electronic voting is hackable. There IS NOT AND WILL NEVER BE a secured unhackable system. Go to blackboxvoting.org to be really surprised. 3. Recounts are possible with paper ballots. Recounts with Electronic machines are NOT RELIABLE since all electronics can be hacked. Please people!!! The tiny fraction of people who don’t mark well on a ballot should not outweigh the loss of voting integrity using electronic machines. Smart unethical people behind the scenes will take control if we choose electronics. Diebold, the largest electronic voting machine manufacturer, is in a word… Evil. Go to hackingdemocracy.com which is an HBO Documentary on the outstanding work of Bev Harris who is casting a light on how unsecure the whole electronic voting industry is. no black box voting. when technology counts the vote, only the manufacturers and technicians know how its really counted. and the kicker? once the system has been in use for say, 10 years, when you question the results because you suspect the machines are rigged, you’re called a CONSPIRACY THEORIEST. who would bother to rig an election anyway, they’ll ask. how could it ever be kept secret? ideas of vote machine rigging are just CRAZY. no thanks, i want people armed with nothing more than their own eyes, and common sense, to be able to observe and verify every step of the counting process. there is only ONE WAY to do that: HAND COUNTED PAPER BALLOTS. Overvotes should be detected. In Cambridge, MA the optical scanners reject the ballot if they see more than one candidate voted for. The voter has the option for getting a new ballot or resubmitting the ballot which is placed in a bin for review later and not scanned. I think most of these challenged ballots could be attributed to being post-stroke or Parkinson’s-like tremors. There were only 2 or 3 wherein the voter really messed up and failed to ask for a new ballot. As stated by many people above, regardless of voting method, there will always be people who don’t read the directions. In any event, USUALLY the intent was obvious (and the law states that is most important) and judging by how the vote was exhibited after each ballot, it was to almost 100% of the others voting here as well. Given we didn’t see on the entire ballot, so we couldn’t check for consistency, I think this recount will turn out to be a major stroke in FAVOR of our voting system in Minnesota. It is nice to know we are still tops in SOMETHING. WHY would we change a voting system that has been rated TOPS in the country for years based on a few questionable ballots filed during the closest race in history? I don’t see how this would even REMOTELY be interpreted as a need for a new voting system. If anything, I would say, it is a testament to the candidates running CLEAN campaigns since the TV commercials for the senatorial campaign were dirty. The results for president weren’t close at all! That could be because we tend to be a state of swing voters, but I think many felt there wasn’t a really obvious choice for senator. I don’t understand what some people mean when they say we need to stick with paper ballots. They use paper ballots in MN. The ballots are just tallied by machine. In Wisconsin we use a paper ballot that requires the voter to connect two ends of an arrow by filling in with a pen. The optical scanning machines reject any questionable ballots including those with smudges, inadvertant marks, double voting (i.e. a straight party vote plus individual candidates). As a poll watcher (recommended, if you’ve never done it), I’ve seen ballots automatically rejected by the machine and the voter is then given a new ballot. Pollworkers partially tear and fold the rejected ballot and preserve it in a designated location. One of the more troubling things I heard about voting in MN this year was the apparent failure of officials to program the scanning machines so tallies could be transmitted directly to a central location. The irregularities that occured in MN this year are disconcerting and discouraging. Electronic voting? Are you kidding? They actually SWITCH votes, and the guy demonstrating how to reset the machine in a news story STILL got votes switched after the reset. I think perhaps the optical scanners need to be recalibrated as some of the ballots shown should have been spit back out as overvotes. When that happens, the poll worker should tell the voter they overvoted, should explain that makes their ballot defective, hand them a new ballot, and explain slowly and clearly to fill in the circle next to their candidate’s name, perhaps showing them a dummy ballot with fake names on it. Optical scanner are the cream of voting machines. More voter information, and clearer voter information is needed. The software in the electronic machines – indeed, in all programmed voting machines – can easily be, and has been (2000, 2004 – especially in Ohio) tampered with, and without leaving a trail of the tampering. We should actually go to paper ballots, hand counted with witnesses/videocams, with tallies signed off by reps from each political party represented on the ballot. Each district shouldn’t have more than 2000 people of voting age in it – how hard is that to count, even if everyone voted? Florida got rid of electronic voting machines between the 2006 and 2008 elections. Florida now uses optical-scan ballots statewide like Minnesota. That is because in FL-13 in 2006, the electronic display caused so many people in Democratic precincts to accidentally skip the Congressional race that the Republican won. As pointed out in a comment above, at least when people make a mistake on a paper ballot, there are clues to their intent. Let’s face it, anyone who can’t figure out how to fill out a bubble isn’t going to be able to figure out how to vote electronically, either. We have the best voting system in America, we most certainly should not change it because of a handful of errant votes. It’s interesting that due to wording of Minnesota Statutes 204C.22, subd 3 and subd 4, a write in for a candidate with no mark next to it and a mark next to the name of another candidate actually constitutes a valid vote (votes?) for two candidates. If you don’t know how to vote, you don’t deserve to vote. Paper ballots are the only fool proof system. The problem with the paper ballots used in Florida (2000) and Minnesota (2008) is not the paper voting system in itself, it’s the overly complicated ballot design. Other long standing democracies have a much simpler looking ballot: Just the names of the candidates with a big round circle next to their names. Mark the circle and that’s it. If people are too dumb to read ballot instructions and too ask for a new ballot if their ballot doesn’t meet the instructions, let their votes get thrown out. These are not hard instructions. These ballots make the case for better ballot design. They may also make the case for clearer and more detailed laws regarding determining voter intent. They do not make the case for electronic balloting, because the lack of effective security undermines voter confidence, and confidence is the most important thing our electoral system has. Better design, with easy to follow instructions and simple graphics, like that of the Design for Democracy project at the University of Chicago, has been shown to help minimize these not at all unusual voter mistakes. An Oregon-style vote-by-mail system where voters have more time to study their instructions and their ballots could also help. People need to be reminded that they can be given a new paper ballot if they make a mistake marking the ballot. Election boards could standardize the types of pencils and erasers they use so the erasures aren’t so likely to smudge. Although the Constitution leaves elections and voting to the states, we certainly do need some standardization on the national level, and without it, Barack Obama couldn’t have been elected. Early voting certainly showed that more people will vote if given the opportunity. Electronic voting as it stands today is less secure and accountable than ATM machines – so there is no excuse for the situation that exists. The problems with optical reading of paper ballots are small compared to the abysmal state of electronic voting machine accuracy and security. Campaign funding and lobbyist influence in politics are far more serious issues than taking the time to count the vote accurately by hand. When campaigns are funded by public funds and no advertisements are allowed, it might be time to address electronic voting machines. There is no argument here for electronic voting. Instead of making voter intent clearer, electronic voting will just remove all evidence of the difficulties that voters have with the voting system. It would only replace uncertainty with the illusion of certainty. With electronic voting where the user touches a screen, there is NO WAY to go through the process of re-checking, re-counting, as they are doing now with the paper ballots. If there is doubt about the outcome, too bad. For example, if one candidate gets 100% of the votes that would be highly suspicious but totally untrackable. Even with paper receipts there is no way to verify what the voters’ intentions were. It is too easy to tamper with electronics. Everyone must trust the process for it to be democratic. The simplest method is paper and pencil. Power outage? It’s a reality at any time, anywhere, for many reasons. It happens. My paper vote can still be cast (taken?/accepted?) by candlelight. It’s old-fashioned, but that is why I ultimately decided that elections cannot rely on electricity. In the event of a power outage, what are the polices? Even our ‘modern day’ electronic “quick counters” would be rendered useless. Security could be questioned in the dark. Voting cannot be halted or delayed!!!!!! Could I be more non-partisan with that response? I am having a hard time understanding your system of voting. When I saw on TV the long lineups of people waiting to vote I said to myself wow a lot of Americans are interested in voting. Then I saw Barack Obama and his wife voting in Chicago and it seemed like it took them 10 minutes to cast their ballot. In that particular area it looked like there were 5 or 6 voting booths, then I realized why there were long lineups. Later on I heard people complaining that it took almost 30 minutes to cast a ballot. It seems that every State has its own system of voting. For a World Super Power you sure have a “Mickey Mouse” system, no wonder people got fed up waiting to vote and went home. Here in Canada only about 40% of Canadians take the time to vote, if we had a system like yours that number would drop to 10% . At precincts as you are handed the ballot, people should simply be told in a friendly manner, if you mismark the ballot or smudge it, it might be rejected, and they can get a replacement ballot if they wish. I like paper ballots with immediate electronic scanning. If the machine has trouble, you can request a new blank ballot and try again. Plus you have an immediate electronic count and a paper trail for a recount if necessary. If anything, this proves that paper can show intent in a way that is impossible with electronic voting. People can, and will, make mistakes with any voting method. We cannot prevent it. Here, we are being shown paper-specific mistakes, ones that would not appear in the same form with electronic voting. That in no way means that the same people, or other people, would have voted their intent clearly and correctly with electronic voting. One thing that electronic voting can do is *hide* the mistakes. When someone doesn’t realize that they’ve selected the wrong candidate (a much easier mistake to make on a computer than on paper), it will still *appear* to be a clear choice. We would be fools to be fooled by this into thinking nobody has made a mistake – it just means we can’t *see* some of the mistakes. Another problem with electronic voting is that the computer software can have bugs. Voters don’t make mistakes, yet we still get the wrong result – and we’d never know. Paper cannot have bugs: it records exactly what the voter marked, and if there’s anything wrong with it, it’s obvious. Furthermore, from what I’ve learned as an election protection volunteer, people actually make mistakes *because* of electronic voting, when they are not computer literate and especially when their language skills are weaker and they can’t get effective help. People make mistakes with computer voting that they’d never make with paper, because everyone understands how paper works and how to use it. Nothing is fool proof because fools in the ignorance turn to be ingenious. But, paper ballots are pretty close to fool proof when properly examined. They’re also cumbersome to complete. My State’s ballot was 4 pages long this election, about average. Let’s get voting moved to the word processing age in larger precincts. 1. Go to the polls. Enter the voting booth. Fill out the electronic ballot. 2. When the voter provisionally completes the entire ballot, have “pull” the lever, displaying the “receipt” ballot showing the how that voter cast. 3. If the voter needs to make changes, “unlock the lever” and let the voter makes changes. then return to step 2. 4. Once the voter is satisfied, lock in the vote and print a paper “receipt. The voter should inspect the receipt. 5. The voter then takes the receipt to the tabulating machine, The receipt is run through the tabulating machine and the receipt is placed into the ballot box. Voila, a triple entry system, circa 1980, with which voters can make certain their vote will be tabulated correctly whiole spending a minimal amount of time filling out the ballot. This system would be far quicker than completing manual ballots hand The Vote examiners will have two sources of backup that should always agree. And, before people blither, I haven’t addressed each nuance because I’ve run on long enough. But, any competent systems or QA analyst could seal the deal. Of course, at some point we will have reliable internet voting. I hope I live so long. No electronic voting — it doesn’t make anything better, it just hides the problems. This system is great, and I wish we had it in NY. Even of the challenged ballots, most all the ballots have obvious voter intent. The few which don’t are cases of very confused voters, and electronic voting would just cause those confused voters to have their votes recorded randomly, for God only knows who, rather than having the ballots rejected. Hitting the wrong part of the touchscreen is pretty darn easy. did anyone have difficulty voting with the radio button on this website? do you feel your vote was recorded accurately and included in the results above? Not to blither Bubbuh, but if I read you correctly, you state the voting machine should be in effect a “word processor” that prints a paper ballot or “receipt” that is then put through a tabulating scanner, afterwhich, the receipt is placed in a ballot box… correct? Why purchase phenomenally expensive electronic voting machines to act as word process and printer when all you needs is the friggen ballot and a pencil to fill it out? The cost to print ballots is nowhere near what it costs to buy electronic voting machines, program & maintain them. It is simply a gargantuan waste of money and man hours. Electronic voting machines “far quicker”!?! Honestly, just how many seconds are saved using an electronic machine over a paper ballot? Consider that for long lines, it’s far easier to put in more paper ballot stalls than electronic stalls. …and did I talk about cost savings!?! I won’t even get into the fact that all electronics can be hacked. (I do note your voting machine idea can not be hacked because the machine is only acting as word processor and printer and it does not store any information to be counted. However, the tabulator is easily hackable in oh so many ways). Okay… enough of my blithering. If paper systems are to be kept around I think we should throw out the pens, pencils, and markers. Instead, people will put stickers next to the candidate they’re voting for. No errant marks, no strike-throughs, and no over-voting except by idiots and assholes. Well, I guess you need something for write-ins, but just make a strict rule that anything outside the write-in box invalidates the ballot. Electronic systems are superb at avoiding “spoiled” or rejected ballots. Fraud is still a big problem though. Unless you go with the sticker idea we should all move towards electronic voting. In the short term they should print receipts (whatever that’s good for) but we really need to shop around and stop relying on Diebold for all our voting machines. Electronic voting machines are one of the stupidest things we have ever done in elections. What, do we want the Chinese to run our elections remotely? Do you know that some machines used in elections were found to have been infected with a worm WHILE THEY WERE BEING USED FOR VOTING? Using Windows-based computers to tally the results is an even stupider move, since Windows has so many security problems. Other countries manage to count ALL THEIR BALLOTS BY HAND, and come up with results faster than our “fast” computers. Please, please, please go to bradblog.com and see just how untrustworthy these machines are. They don’t count votes right even when they aren’t hacked into, because of various ballot-programming errors or just plain glitches and bugs in the software or hardware. Democracy is a sham when the election results no longer reflects the actual votes. Pay attention to the Franken recount. I think you will be surprised what happens when you actually count the votes by hand. The results might actually match the polls! Imagine that! You are totally wrong, Martin K. Vote-tabulating machines, no matter what type will always be a security concern, especially when they obfuscate the voting process. People looking at ballots by hand is a far more reliable and trustworthy method that is far more transparent than any “electronic” voting machine could be. For best results, the ballots should have the simplest possible layout. A bubble and the candidate’s name should be all there are on each line. (Those black boxes on the Minn. ballots may have been confusing to people with visual and/or perceptual problems.) Designers of ballots should always concern themselves with how to make it easy for people to vote. If ballots are designed for people with visual disabilities (of all sorts), the ballot will be right for nearly everyone. However, mistakes will always be made, and electronic voting is NOT the answer. I simply cannot trust my vote to be counted by a totally electronic system. After seeing all of the problems had across the country with these voting machines I do not understand how anyone would ever consider building MORE of them. If I read the news correctly on Election Day, a precinct in Georgia had to send out for PAPER ballots after 5 of 7 machines didn’t work. And even if there were a paper trail, that printout might only reflect what a hacker intends it to show. When I vote I want to know that my voice will be heard, not wonder whether or not my machine was hacked. I don’t know what more instruction anyone needs in filling out our ballot. At least in my precinct, every person gets a little piece of paper showing you how to fill in the ballot. For those who have disabilities that would prevent them from accurately filling out the ballot by hand I would certainly hope that the state has a system in place. But for everyone who is capable of filling out their planner or balancing their checkbook, well, voting is considerably easier than either. While efficiency may be important in our daily lives, confidence in the vote must not be compromised. I don’t care how fast paced this world becomes, if you cannot take the time to go to your polling place and fill in a bubble sheet ONCE in an entire YEAR then you must value the convenience you gain more than the credibility of our democracy. If my grandfather, a veteran of WWII and Korea, were alive to see us thinking about perverting what he risked his life for, I cannot imagine the fury with which he would speak. And this business of not having enough registration or ballots at every precinct? If thousands of people can get the Press or Tribune on their doorstep (or all too inconveniently, lately, the end of my driveway), then we as a state can spend the money to have registration forms for every new eligible, non registered voter, at every precinct, and a ballot for EVERY person of voting age in the precinct (and then extras for people who need a new ballot after making a mistake). It would be a small price to pay for something so fundamentally important. So (if I wasn’t clear 😉 let’s stick with what we’ve got. The question doesn’t ask about touch screen voting. It asks about electronic voting. In my hometown in Illinois, at my polling place, they had electronic voting machines. It was AWESOME. I have a visual impairment but I’m not completely blind, so the large screen and large lettering made it very easy. And there was a jog dial, a spinning dial that was used to cycle through the options. It moved at a reasonable speed and was very easy to use. I think the misspelling section of the voting law is very disturbing. If it’s close, count it. Someone might know who they want and they might not be on the ballot, but they might not be able to remember exactly how to spell the name. And the problem with DIEBOLD was that it was a proprietary system and there apparently weren’t any laws that affected how the computer program worked. There must be stricter regulations and obviously one private company should not have that kind of access. And there should be some sort of physical receipt/evidence of your vote. Maybe you vote electronically and then submit a receipt that clearly states each person you voted for, which you can review immediately to ensure you voted the way you wanted. And the software MUST be open-source and made available to programmers. I would prefer that to a scantron optically counting my connected arrows. I don’t like that the scanner can see my ballot better than I can. And style of ballot should not vary between states. There should be a nationally agreed upon ballot, be it electronic or paper that is used nationally, at least, for national elections. I sat in on a number of meetings of the Interium Legislative Commission back in the late 1980’s that made the proposals for modernizing our elections system, and resulted in the system we use today. It might be useful to know some of the issues that were considered — though someone could go back to the eventual Legislative Debate and Committee Hearings on the topic too. We adopted pen and paper largely because the Commission heard from Survey Research Experts who knew more than 50 years of data about measurement (and a ballot is a Survey Measurement instrument) that no system known to man was better than ticking things off on a paper list with a pen or pencil. One has to remember, you design for a Universe of voters with little education, and considerable education, and everything inbetween. You design for everyone between age 18 and perhaps 110. You design for much experience, and no experience. You design for those with high verbal skills in English, and very limited skills. One Person one Vote means you must select the must universally acceptable with the lowest possible error rate. That must be your prime consideration. How fast you count ballots and relative costs and the like, must be secondary considerations. In the late 80’s Minnesota needed modernization. We had five different kinds of ballots, with very different error rates. Not tolerable if you honestly want to offer equal protection of the voter’s right. The most accurate were probably the old lever machines, but the company that made them had gone out of business, and we had to buy used machines from other states and cannabalize them for parts. They had to go. We had punch-cards, and their error rate was three times other systems. So the need to modernize and standardize. We had some of the vendors of the proposed (not yet available) electronic machines make their pitch, but they had absolutely no track record that could be used to validate them. In the end then, it came down to pen, paper and scanner, largely because the Legislative Commission was impressed by our own home grown experts at the University who had been administering the MMPI — Minnesota Multiphasic Personality Inventory — for then about 50 years, and they had tested every system of measurement available, and they had the data to sustain the claim that ticking off choices on a paper list with a pen was the best system available. Moreover, the U of Minnesota all ready owned the MMPI scoring system, and it was no big deal to adapt it to voting requirements. Result — we don’t have to pay fancy vendors for election services, we can do it all in house with State and County Civil Servants. That Legislative Commission did other things — it recommended methods for keeping our voter rolls up to date on a continuous basis (we don’t do purges you see), even though we have registration at the polls which vastly increases the rolls as corrections are made. It also standardized a number of language usage matters regarding the presentation of the ballot. Most important, it put into the State Statutes all of the rules — such as those currently being used for the recount — meaning that we don’t need to depend on one-off court rulings or Secretary of State decisions. It is all in the Law. Joan Growe should be given credit for spending several years moving this huge project through the legislative process. It isn’t just how you count votes, or any other single piece of it — it is a whole system, with each part of it linked up with all parts of the system. Joan Growe makes the case that the Legislature needs to provide funds for training our poll workers and Judges — and sometimes she didn’t get enough from the Legislature. But I would suggest the best way to “educate” voters so they properly darken their bubbles might be a good video that could be played on TV in the days before an election, and perhaps available at polling sites on a DVD on a small screen. A two or three minute demonstration as to “how to do it” pretested on a very diverse universe of potential voters, might help a good deal. In the old lever machine days, we used to have a practice board with levers, and you could play around with twisting them while you waited to get your ballot. In Los Angeles county, we have ink marked ballots, that are optically scanned, but you insert them into a guide and push the pen through the holes. You cannot make stray marks or vague marks- either it’s a dot on one of the circles or it isn’t. You only have to pick the correct circle to stick the pen into. Much better system. In my opinion, if one needs to attempt to determine intent because of a lack of clarity, the ballot should be tossed. You don’t want people trying to determine intent. That’s why sports officials and rules makers try to avoid it as much as possible. Electronic Voting? ABSOLUTELY THE WRONG SOLUTION! Electronic voting appears to be designed for the convenience of vote riggers, manipulators and other frauds. I think that politicos in large parts of the world are stunned by the time it’s taking to get results from these elections. In third world India they manage to count several times as many votes within the day, often in elections with ten or more real candidates. They do it with paper and the results are accepted as being pretty honest. There are times to rely on technology and others when the old fashioned ways are quicker and more transparent. Reliance on electronic voting is a recipe for fraud even when paper receipts are given. As someone who scrutinises in British elections – all paper at the moment but the government is trying to get more corruptible methods used – we are able to check what is going on and get a result in just a few hours. There is a body of statute and case law which everyone at the count knows and which is applied quickly and cleanly. Outcome: a result which is accepted as honest in a timely manner. We’ve used electronic systems in Collin County for several years. My wife, a recently naturalized citizen, has had the opportunity to try seeral different voting systems. She claims the systems we use to be very clear. May the Lord have mercy on us and grant us leaders with wisdom and understanding. From whatever party they may originate. If these idiots can’t operate a pen and paper, what makes you think they can operate a computer? We should definitely not switch to electronic voting in Minnesota. I can’t count how many times I’ve expressed gratitude for our paper ballots. Standardization of the ballots (no connecting arrows) would be a good thing, but there is nothing wrong with our current system. I think if anything, this shows the need to keep paper balloting. Paper ballots should be required in every voting situation, so that there is a hard copy paper trail for verification of the vote. I am very thankful that we have paper ballots in Minnesota! I would be very distressed if there was any kind of move toward an electronic voting system here. Voting machines are unaccountable, untrustworthy, and a waste of money. Everyone makes the first two points, so I want to focus on the third and note that it would be cheaper to pay people to hand count elections. Voting machine systems are very expensive. Ask your elections official some time what they spent on the systems already in use. All that electronic voting would do is cover up stupid voter tricks. At least we have a chance to review and evaluate the ballots. I’m NY. We used our pull-lever machines again this year, although they were supposed to have been replaced by now. I wish we would keep them. None of the ambiguities in these examples are possible. That said, I am wholly opposed to electronic voting that has no paper trail. The track record says all the machines that have been used so far are too easily tampered with. Paper ballots are the ticket, as this recount is demonstrating so clearly. Paper receipts? Ridiculous. Why is this even being offered as a solution in this poll? What good does a “receipt” in the voter’s hand do for a recount? You want that every voter come back in and give their receipt to the recounters so that they can count it? Electronic voting? So that cheating is completely undetectable? Yeah, right. It all comes down to ballot design and verification. Paper ballots are every bit as easy to “hack” as electronic voting machines – and, for the record, optical scan machines are electronic voting machines, and many have been shown to have the same flaws as other electronic voting machines. Touch screens should never have been considered for use in voting machines. The hardware is not durable and prone to calibration errors. It seems obvious to me that electronic voting needs to give us the best of both worlds – use the machines to create paper ballots. The ballots can then be read by an optical scanner (which people seem to trust) or simply used for recounts. Having the machine create the ballot can reduce the error rate by disallowing multiple selections and stray marks, and by giving the voter a chance to verify the selections before producing the paper ballot. This is a little off topic, but scorn and derision are not particularly helpful in solving the problems of human error in ballot marking. Everyone has a bad day every once in a while, and not recognizing a mistake is not the same as being stupid. I served as the volunteer lawyer for the Franken campaign at the recount in Lake County on Wednesday. I personally looked at between 3,000 and 4,000 ballots that day. All but a tiny few were filled out correctly with only six challenges to the approximately 7,000 ballots looked at. That isn’t even 1/10th of 1.00%. Our current system is very reliable, results in a paper trail for recounting and is easy for the vast, vast majority of our citizens to use. I was a nonpartisan election judge in St. Paul on Nov. 4 and there were enough poll workers to handle the crowds—even @ the busiest times. I was stationed at the ballot box and, following the head judge’s instructions, made it clear that—if the machine spit out the ballot (which it does for over-votes)—then the voter can return to the ballot table for a new ballot. In our precinct, everyone with a spoiled ballot went back for a new one, re-voted, and had the optical scanner accept their vote. I think the MN voting system is wonderful and has virtually no opportunity for “funny business.” Of course there will be a small number of voter errors, no matter what system we use. But I think our system tends toward the least number of such errors—and makes it virtually impossible for a candidate or party to manipulate the results or the ballots (as apparently happened in FL in 2000 and OH in 2004). We should be very grateful for what we have–there is no reason to change it. The “problem” behind the recount is that MN voters are so evenly divided in their choice for Senator—not that the voting system is broken. OK, let’s accept that some folks are ignorant of proper voting procedures. While one part of me thinks that their ignorance is grounds for public flogging, the teacher side of me thinks a public education campaign on proper voting procedures would be more beneficial. As well, poll workers are woefully understaffed, and undertrained. Educating them first would do wonders. Simplly asking each voter a series of questions to determine if they are familiar with the voting method they are about to use, showing them samples of properly marked ballots and improper markings, and asking them before they leave a series of questions about teh type of marks they used could solve many problems. As well, maybe a system of independent “reviewers” could be made available to those that want their ballot reviewed VOLUNTARILY for errors? I’d do it. What is shows me is the optical scanners could use some improvements too. But your INTENT was clear! And you clearly intended to have a period after “too” — But your INTENT was clear! A comment on those ballots where there was a write-in for someone but a different bubble had been filled in. I see no reason why they should be rejected because it is obvious who the person was voting for even if they decided to write someone else’s name in the write-in blank. If they had really intended to vote for that write-in person, they would either have filled in the bubble or left everything blank. No electronic machines. Ever. I like what we do in Los Angeles, at least in my polling place. We mark an optical punch card. When we give it to the poll worker, they stick it in an optical reader right in front of you. If there is an overvote, undervote or other potential error you are told and given the opportunity to try again. Not 100%, but it would have caught several of the problems in the samples shown in this article with the voter still present so that their intent could be clarified on the spot. But there *must* be a legal, indelllible paper trail that can be reviewed by a human who will apply human judgement. One and Zeros are way, way too ephemeral and mutable, both by accident and by malicious action. It shows that the ballot should be run through a scanner for quality checking before being officially submitted. If you could verify that your ballot was perfect, with every race voted on before submitting it, it would eliminate these types of errors. You’d have to include a bubble for “I’m not voting for any candidate” in each race for this to work but at least someone would know if they had skipped a race. Also, I don’t understand why there are so many old scanners that don’t pick up faint markings. Perhaps you need to have pens issued with the ballots so that this isn’t a problem. What about it illustrates that the paper system is best, because most people agree on how to read even the most “challenging” ballots. The choice of paper receipts, while superficially appealing, is illegal in 50 out of 50 states because it violates ballot secrecy and permits fraud. 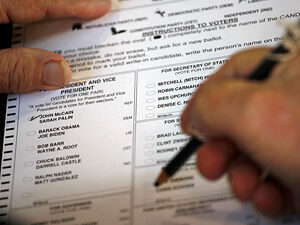 The Federal government really should step in and create paper-based national ballot standards. Every election we have ballot-related issues in a different state, be it Florida, Georgia, Ohio or now Minnesota. And for all the above-mentioned reasons, black box voting machines should be eliminated. I think these ballots make the case for adaptive voting. People have different capacities and we’re making everybody try to do exactly the same behaviors. We should instead modify the technologies so that we get the same results from different inputs. Electronic touch screen voting appears to be slower and less reliable than bubbles. So those voters who are fast, agile and prepared can fill in paper ballots by hand. If they make a mistake, they can start over. People who want time to think about the questions in the booth or who have less manual dexterity can be routed to electronic machines. These should be decoupled from counting machines. The machines should take the votes and print out a completed paper ballot for review and scanning. People with mail-in ballots should be able to exchange those ballots at early voting for one of the other methods. This allows them a way to exchange spoiled ballots. No blank spaces should be left on the design. There are things you have to sign to submit a mail-in ballot, there should be no spaces that can be mistaken for a signature space. Finally, I think one of the options should be to take a sheet of matte black bubble stickers to the booth with you. A voter can place these over the bubble for their vote. This reduces the agility requirement for voting. It seems to me, quite a few people should have asked for another ballot. It is also clear that many individuals did not follow directions well in school (who hasn’t taken a test on a Scantron) or the ballots in error belonged to senior citizens who didn’t have the joy of filling in bubbles in school. The Irish Independent Commission on Electronic Voting and Counting at Elections was established to report on the electronic voting and counting system that had been chosen for use at elections and referenda in Ireland. The Commission’s reports found inter alia that the security of the hardened PC proposed for use in preparing elections and in aggregating and counting the votes afterwards was inadequate and needed to be improved. Improvements were also required to the security of the methods by which sensitive election data, including votes, were stored, transported and accessed on ballot modules and CDs. The Irish Governement was forced to abandon electronic voting because of the Commission’s work having spent over €50 million on voting machines. I understand the machines and software the Commission had such prolems with are in use across the USA. Look! It’s the “paper *receipts*” strawman, again. No one, *ever*, is advocating “receipts”. Receipts are things you can use to prove to someone that they should pay you for the vote you sold them. On the electronic voting front, though, electronically assisted terminals with a “NO VOTE” choice will authoritatively end under, over, and probably mis-voting. And finally: the voting systems problem *has already been solved*. Even before 2004. It’s just that no one in power was *listening*. Terminal does no counting at all, merely assists on low-vision and no-vision voters, then prints a human-readable (but not touchable) OCR-A ballot card and drops it into a clear plastic validation hopper at the terminal. You approve it, and mechanically drop it into a ballot box or a discard box; if you discard it, you get to try again. The boxes are cheap, and locked, and can be easily swapped by the poll workers; they get unlocked only for counting, with a key that isn’t in the precinct until T-30 at the end of the day. Recounts are a walk on, since humans and computers read the ballot card for counting in exactly the same way. The terminals are off the critical path since a) they don’t do any counting, and b) the voter reads the final ballot card for approval *and sees it go into the ballot box*. End of problems; everyone can manufacture the terminals and scanners. No sense in monkeying the code on the counters since recounts are trivial, and you can actually double-count the ballots through machines made by two different makers. Oh: *MANDATE* “None of the above”. And it’s even *cheap*: competitive market. First, electronic voting should only be implemented under two criteria: 1) the technology supplies a voter-verifiable paper trail, and 2) the voting machine software is 100% open-source and available for public review and verification. No black-box voting. Second, who thinks these voters who can’t fill out a simple ballot properly would be any better at using a computer? They probably don’t even have computers and have barely ever used them. It’s silly to assume that would be an improvement over the much more familiar pen & paper system. I don’t wish to sound like an ageist(sp), but this seems like it might be an issue of unsteady elderly hands at work in at least some of these cases. Perhaps, we should alter the ballot to use those Bingo stampers, (or something like em) instead of pens it would make for filling out the ballot easier and perhaps quicker for all/ Might cut down on the mismarks. Wouldn’t solve overvotes however. And, one note to everyone here who’s dissing ‘electronic voting’. Why aren’t you being more clear in what system you don’t like? Do you have your own hidden agendas? Or are you just sloppy thinkers? Clearly, as my post immediately above notes, you’re only dissing *the current implementations of electronic voting*, which count votes in the terminal with no audit trail. And also clearly, that’s not the only way to do it. Let’s not throw the baby out with the bathwater, whether it has melamine in it or not, shall we? Computer Assisted Paper Voting is a perfectly serviceable approach, and fixes a bunch of problems that we really do have. Just goes to show you the ignorant people voting for a candidate for the wrong reasons, in most cases. Anyone watch Jay Leno and the typical people on the street that know absolutely nothing of a candidates positions, other than what a liberal leaning press and television has supported with their propaganda? 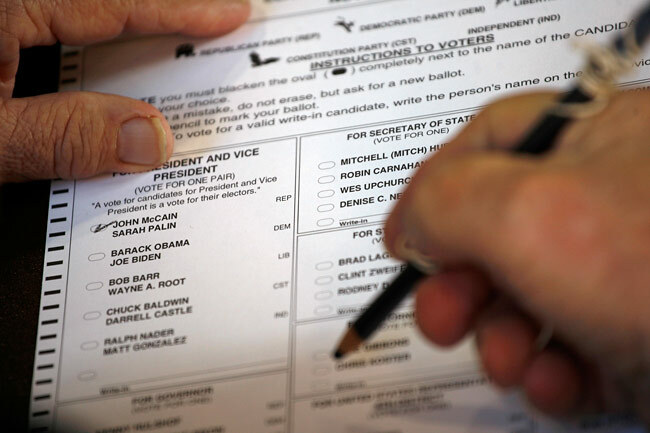 Paper ballot, print in the name of the candidate, – no party labels attached, without any help or prompting – also spelled correctly First, Middle and Last – otherwise an invalid vote. That would eliminate most of the stupid people from thinking their vote really made a difference anyway. If someone wanted to bote, they would at least have to study enough to spell their candidates name. If someone can’t learn enough of a candidate’s campaing promises to learn know how to spell his / her name, invalid. That would also eliminte those that voted in exchange for a pack of smokes or a bottle of booze, registered by ACORN. 1) Every voter’s votes should be counted. The notion that someone who has trouble filling out a form should not count is unconstitutional disenfranchisement. 2) When more than enough votes to change the outcome of an election are difficult or impossible to judge the intent of the voter, clearly a better system is needed. Exactly what that system should be can and should be debated, but sticking with hand filled out paper ballots is clearly not the system that should be used in this day and age. I don’t like the fact that there is not a tangable, human readable record that is, itself, the actual vote. Electrons on a flash memory chip just don’t cut it for me. I can’t see them, touch them, count them myself. To count the bits and bytes I will always need some aparatus that I didn’t make that will tell me what it sees, not what I see. Perhaps such a system could be engineered to be as reliable and secure as paper and ink, but even if it could, the slip shod, utterly crappy engineering of the current systems should make anyone alive today permanently suspicious of them. Perhaps we can try again in the 22nd Century. But not on my watch. My experience as a recount observer the past two days was that many of the ballots that would be unreadable by the machine (because the voter had put some sort of marking in more than one oval etc.) were on absentee ballots. The absentee ballots have a distinctive fold. I don’t know if our election system allows for an absentee voter to include a note explaining intent on a race where their ballot markings may invalidate their vote in that contest. I think we should allow election judges to complete a new ballot with the accurate information and keep the original in the duplicates envelope, just as they presently do with the ballots from oversees that arrive in a format unreadable to the scanner. We already use computer assisted paper voting in Minnesota. To be in compliance with the Help America Vote Act, each polling place should have at least one Automark machine (http://www.sos.state.mn.us/home/index.asp?page=1152). The machine produces a paper ballot that is fed into the optical scanner. Computer voting, paper ballot. Any voter who wants to can use it (not just voters with disabilities). I don’t know how many actually do. I’m not advocating to switching to all Automarks, however. Election equipment is the primary responsibility of each county, and a full-state switchover is a huge expense and frustration I just don’t see any justification for. It makes planning for high turnout years and unexpectedly high turnout much harder; as some commenter upthread said, it’s a lot easier to set up another voting spot with blinders than another computer. Another upthread commenter mentioned power outages: we had one in Saint Paul on election day this year. Voting went on without interruption, and all votes were secured and fed through the scanner when it came back online. Hard to guarantee that when using an electronic device for ballot-marking. Our system is GOOD. It is (relatively) CHEAP. It is easy to expand and contract as voting numbers rise and fall. It is accurate. As yet another upthread commenter said, the problem this year isn’t with the balloting process, it’s with the race itself. This race is like a 500 year flood. To me, it looks like the levies held with only a little spillover, and we’re mopping up. Maybe when we’re done, we should add a bit more to the top, but there’s no need to redo the whole system. Lets just stop this recount, and turn it over the US Senate to decide. After all the US Supreme Court was able to decide to stop a recount, and install our president. Let’s just save time and hand it over the senate right now. I think electronic voting isn’t such a great idea from what little I know about it. I’m imagining touch screens that don’t work properly, software that keeps freezing up the computer, lost voting data (e.g. electronic ballots) for one reason or another, power outages that are bound to happen somewhere, so how would that work? I imagine that there would be a lot of frustrated citizens out there as a result; And just because I may be able to understand and use an electronic voting machine, that doesn’t mean that my 85 year old grandmother is going to understand the concept. I live in Montgomery County, PA. We have electronic voting machines. It was simple & very easy. The entire country should be this way. I realize that a lot of voters would want a paper back up. Computers are so cheap these days, It’s possible to vote electronically then press print to have the paper back up. Just think how much money Minn. is spending on this recount. NEVER EVER USE ELECTRONIC VOTING! Make voting by paper and counting by hand a time honored tradition. ELECTRONIC VOTING means profit to somebody, shady deals, tampering. And by that logic, if they had really intended to vote for the person whose oval they filled in, they would not have written in the other name. Bit at least we *can* recount. If there’s any suspicion in an electronic voting result, what can you do? There is simply no good solution. And don’t go telling us computer voting is secure enough, given today’s news of a massive virus outbreak in the pentagon of all places. If the pentagon can’t keep their computers secure, how can a few volunteer election judges without any information security expertise? I think the paper ballot with the optical scanner is the best system around. Think about what this article is stating: one 1 in every 2000 votes is being challenged. It’s about as accurate as you can get, and it can be recounted without any issues. Electronic voting sound neat – but as David said, anyone who can’t figure out how to fill in a little circle is unlikey to be able to figure out a touch-screen voting machine. Keep it as it is. Ben, my e-mail also said to print a paper backup. It can be easily done while your still in the booth and just hand it over upon exiting. After the mess in Florida in 2000, and now this is another example, just think how many ballots have been mis-read or rejected and not surfaced over the years? If someone wants to type in a ‘ write in canidate’, he can –but not vote twice like in the case of Lizzard People. I have yet to hear of an electronic system that could be secure enough to my liking. It seems the number of ballots with problems is very small, so following the statute makes sense. What concerns me more is the possible fraud in our state voting laws. To not require a photo ID to cast a ballot is nonsense. I would wager far more votes than these questioned ballots were cast illegally. One more point: if you can write in a candidate, that could be considered as identifying a ballot. And I mean you, Lizard People! Optically scanned paper ballots are technically “electronic voting machines.” The point is that the scanners themselves may not be hacked, but the central tabulators, that the results are uploaded to, are easily hacked. Using optical scanners in an election does not mean you are not using a computer to tabulate them electronically. Just because having paper and pen makes you feel better than touchscreens doesn’t mean the results are accurate. You really need to examine the ballots by hand, and have a large paper trail of all the tallying, so it can be easily followed. This is a far harder system to corrupt on a large scale. Electronically tabulated results can be changed to whatever the hacker wants. And you would never know without hand counting them, so why not do that in the first place? I honestly believe it’s a faster method than the computers seem to be. The most important thing is that, with electronic voting, there can never be any meaningful recount, even with a paper receipt, since experience has shown that the rolls of thermal paper “receipt” copies are, as a practical matter, logistically impossible to recount. The fact that there can be a process whereby all votes can be actually examined by human beings and counted, except those very few that are hopelessly ambiguous, is a testament to the importance of the paper ballot. With an electronic system, a “recount” consists of asking the machine if it meant what it said and getting the predictable reply. Furthermore, anyone who has studied the use of touch-screen machines or other DRE voting machines is familiar with the mountain of evidence that they are unreliable and often very confusing to voters, with the result that they produce a very high number of inaccuracies, either because of hardware or software problems, or because of voter confusion. With an electronic machine, there is no record of the inaccuracies, and no record of voter confusion. I don’t think these ballots make a case for electronic voting. These voters did stupid things, and just because an electronic voting machine would prevent an invalid ballot, this does not mean that a voter making a stupid mistake will not create a ballot that defies his or her intentions. That being said, there are many other reasons why one might consider electronic voting superior. I think the lesson of these ballots is to emphasize clear and simple voting rules. For example, a picture of a proper ballot (voting for Mickey Mouse vs Donald Duck, say) and a statement of marks that disqualify a ballot, posted in the ballot box, might help. Paper with optical readers with verification software at the poling place. That way any flaws or errors in the ballot can be detected and the ballot rejected and REDONE before the ballot goes in the box and the voter leaves the poling place. Stage 1 – fill out the paper ballot with pen. Stage 2 – walk your filled out ballot over to optical verification machine that identifies if the ballot is readable and if there are any errors, like over votes. Stage 3 – If there are errors in the ballot, reject and destroy the bad ballot and return voter to stage 1, to redo a new clean ballot. If ballot is good with no errors, ballot goes into ballot box. This way only good clean ballots with no errors get into the system. Any problems are sorted out by the voter by redoing bad ballots. This would mean almost all votes are then countable by central optical readers since they were pre-screened at poling station. Only one optical verifier needed per poling location, making it a lot less expensive than electronic voting where you need one machine for each voting booth. Voter leaves poling location with more confidence that that their ballot is readable and won’t be rejected. Totals from poling place optical verifiers can be cross checked with the later numbers generated from the central optical readers when the county puts all the ballots through the central high speed optical reader. If you are so stupid you can’t fill in a circle should you even be allowed to vote? The only trustworthy system is the one they’re using in Minnesota right now, but the little poll here doesn’t even show Paper Ballots with Recounts in Plain Sight as an option. The expectation of perfection with any machine, especially one made with proprietary software, no security, and poorly maintained machinery, is laughable. Aren’t you all viewing and typing in this page with computers? Then you know they don’t work 100% perfectly. With paper ballots like in MN we can publicly recount the original votes. Receipts can cause violence, or will create a market for votes, and in the event of a recount cannot all be found. Not a good idea. Paper trails that are just printed from the same machines that are under suspicion is also laughable, but unfortunately many people who think they have a paper trail, just have a printout with the same wrong numbers. The main issue with paper ballots is that they have to be counted by hand, which takes forever, and recounting is subject to human error. The main issue with electronic voting is the problem with computers screwing up or being hacked. If these errors were to be unlikely, it would be the better option. The Minnesota paper ballot design is fine. People should concentrate more. Errors are rejected on term papers and cover letters for jobs. People should slow down, and not be afraid to ask for help should a mistake arise. Taking correction matters into your own hands opens the possibility of the entire ballot being rejected. I feel that these things become issues only when the vote is extremely close. In those cases I feel the winner candidate is relatively arbitrary, but the candidates have a reasonable right to demand a recount or reexamine questionable ballots. Minnesota ballots are scanned with a machine, so there is still an accelerated counting method. The machine also lets the voter know if the ballot was accurately processed. I think that the machine should reject any questionable markings and demand a fresh ballot from the voter. Each candidate should be assigned a color of a rock that would then be issued, in secret, by a committee of at least one from each candidate’s affiliation to ensure only one rock per voter. Then count rocks and match to dispersal records. Keep the rocks for recount. Then recycle for the next election. Scisors can cut paper and paper can be burned – rocks are forever. It would be informative for the Secretary of State’s office to provide figures on exactly how many of these disputed votes are absentee ballots. I’m guessing 95% or more. I think we have a very reliable and verifiable system already in place, probably the best in the nation. If there’s something in the process that needs fixing, it’s not how ballots are cast and tabulated in the polling place, but how the absentees are handled. It hasn’t gotten much attention in the past because the numbers of faulty absentees are small enough so they usually do not affect the outcome of an election. The absentees are not run through the scanner till Election Day, after they have already been separated from information about who cast the ballot, so there is no opportunity to offer the voter a second ballot. In the precinct where I serve as an election judge in Ramsey County, there is an assisted living facility from which we receive many absentee ballots. Many of the residents have visual impairments and/or conditions such as severe arthritis, MS, ALS, etc., which makes the voting process more difficult for them than the average voter in the polling place. If there is an overvote, the scanner rejects the ballot, and the election judge overrides the rejection. Perhaps a system could be devised to check the absentee ballots in advance of the election and return overvoted ballots to the voter. In order to comply with the law, this would have to be done without anyone except the voter personally looking at the ballot unless specifically requested by the voter. The ballots, after all, are private. I’ve used the Automark machine in my precinct, and I think it works just fine, but it’s slower than just filling out the ballot with the pen. Also, the machines are very expensive. This recount process is demonstrating that the people who would most benefit from using the Automark are not coming to the polling place, so an increase in the availability of the machines, or the introduction of some other electronic option, wouldn’t address the problem if it were instituted only at the polling places. A paper trail is critical. What is also crucial is that when the machine eats the ballot, it should throw back the ones with errors. The voter would then be handed a ballot with a detailed information on why the one he’d submitted had been rejected, and instructed to either vote correctly or have his/her ballot discarded. No way should we go to electronic ballots. Keep it simple with a clear paper trail. These examples are a pittance of the ballots and in no way warrant going electronic. The only problem with going electronic with no paper trail, is that nothing, is unhackable… (with the exception of maybe linux, but I doubt the government is going to try using that) Theres too much room for manipulation in a system that can not be manually checked. This recount will have an insignificant effect on the counts in other races. When ballots with identifying marks are discovered, the entire ballot is rejected. So the number of people voting for president, U.S. congress, state legislature, city councils, etc. all go down. I wonder if “Lizard People” can be considered an intentional identifying mark? This election shows that the ability to hand-count ballots is absolutely vital. If all you could do was to ask the machines to give you the same number a second time, there’s no way to even audit the vote, and that kind of transparency is vital. Definitely better to vote on paper, and have random recounts! See the film “Murder, Spies & Voting Lies” (the Clint Curtis story) and you will understand why. While it is clear that most people understand and use the paper ballot correctly, those error-prone voters are VIPs, since elections in this country are often determined by ridculously slim margins. I think the existing paper ballots are fiddly and over-complicated. Increase the space for each name, increase the size of the oval and make a clearer link between the name and what you are supposed to fill in. The parties and candidates spent billions on the election this year, but we should be spending much more money on researching and improving the voting process itself. In a Republic, voting is the most important thing we do and for most people, elections are the only time they think about politics. 1. Paper Ballot – permanent historical record. 1st Optical Scanner is used to verify ballots. Good ballots would be returned to the voter. Message – You have a good ballot. Drop it into Scanner two. Bad ballots would be shredded and a new blank ballot issued. Message – Your ballot has errors and cannot counted. It has been destroyed. Try again! 2nd Optical Scanner is used to count the vote. Message – Your vote has been counted. Have a good year! 3. Ballots would be serialized with a tear off on the bottom for you to take home. If you are worried about how your ballot was counted just go to the correct URL on the on the Internet and look at it. Are the results correct. If miscounted YOU could challenge. 4. After the ballot has been counted the ballot should be stored in a box that cannot be opened by human hands. It becomes a box of serialized ballots that no one can add to, take away, or modify. My ballot was sent from Singapore. I don’t know if it arrived. I don’t know if it was counted! I find it fascinating that that voter who was prepared to vote a straight Lizard People ticket had second thoughts and voter for Franken. Al, what are you hiding from us? And is it any wonder why children are failing standardized testing in school? These people are neanderthals. I believe it’s God’s way of sorting out and identifying idiots. Dang it! Optical scanners are not a good option. They are centrally tabulated by a computer which can be hacked. At that point without a hand recount you would never know. You would just accept whatever numbers the computer spit out for election results. There would be no way to verify it without hand counting them. A hacker could make whoever they wanted win THE ENTIRE ELECTION. It would not matter at all how people voted. Yet all of you would just go skipping along, lah dee dah, feeling good all over that your vote was counted so efficiently and quickly. A random hand recount of some of the ballots only works if they are truly and transparently randomly chosen. This did not occur, for instance, in many areas around the country during the 2004 election. The “randomly” chosen ballots appeared to be pre-sorted in some cases, and were usually chosen without any supervision. That can derail the only checks and balances against computerized election fraud. And for goodness sake people, when did we start accepting that exit polls can deviate from the actual results. They shouldn’t ever. That is a sign of election fraud. BTW for many years now, all of the exit polling has been corrupted before being released to the public. They modify the raw exit poll data to more closely match the actual results. This is also a terrible idea. Why can’t they release the raw exit poll data? Why in the world would the raw exit poll data not match the results? Why do they have to “massage” it? Makes you think, huh? No I do not own a tin foil hat, however I know quite a bit about computers. As someone who lives and votes in Minnesota – AND someone who was a volunteer observer of the recount process – I wouldn’t trade our process for any other. – Voters ARE clearly told when they get their ballot to come back and get another ballet if they make a mistake. – I can’t even begin to tell you how easy the voting process is – and cost effective. Seems most people know how to use a pencil. No machines to break down, no funny business in the “black box” computer program, nothing that grandma could handle – and guess what – if you want to challenge the results there is a concrete way to check the election results! Paper ballets are very tangible. – For the precinct I observed, there was only one challenged vote – and I believe that will be very clear cut once the canvassing board reviews. And out of the thousand plus votes, the hand counts were dead on compared with the machine counts. – All other ballots were VERY clearly marked. I can’t tell you how amazingly carefully almost everyone fills in those little bubbles. – Based on the training I received and my understanding of state law, most of the examples shown here should be resolved without too much dispute. – It’s was so strange to see this article and the comments that followed because EVERYONE who was part of the recount on the day I participated said – “aren’t you glad we have this process” “aren’t you glad there is a way to recount” “we have such a fair process here” “aren’t you glad there’s such a positive atmosphere between the two parties” Maybe we’re arrogant here in Minnesota – but everyone I talked to from both parties felt our system is much better than most states. Then to read the comments here – I was simply flabbergasted! The percentage of mistakes is very low, and judging from the answers people gave on this website about the disputed ballots, in many of these cases there is widespread agreement as to whether the vote should be counted and for whom. 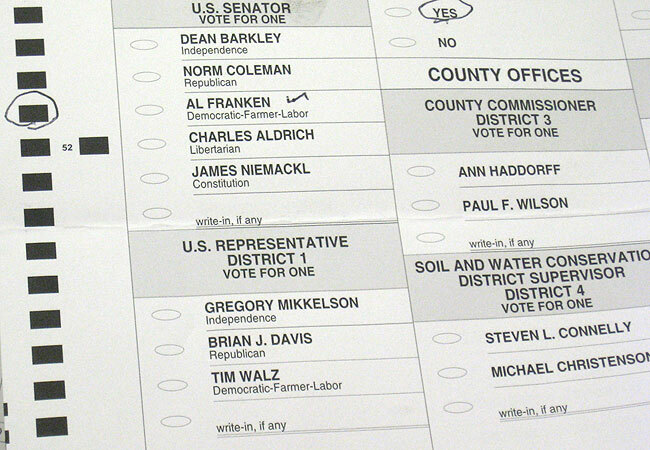 Some of the mistakess, like the person who put a checkmark and circled the black square parallel with a candidate’s name, seem to be due to visual impairment –in that particular case it could have been that the oval was too lightly printed for them to see where they were supposed to mark. I absolutely am not in favor of electronic voting machines because of their susceptibility to hacking… but as Chris Hooten and others have pointed out here, that is also a security risk with the tabulation of optical scanners. I would prefer that all votes be counted by hand, observed by different sides. I know that would not be quick or easy especially with really long ballots. Speaking of which, someone mentioned noticing that the Obamas took about 10 minutes to vote….that would not seem surprising if you’d seen the ballot Chicago voters had to deal with. It was double sided and two columns on each side – a very long list of national, state, county and city offices along with a lot of votes to replace retiring judges and a lot more judicial retention votes, plus at least one referendrum. It probably took me about 7-10 minutes. Anyone who is having problems properly marking a simple paper ballot is going to have far more problems with a complicated voting machine. My answer to the above question would be no…but not for the reason given. Why don’t you just call these people up and ask them who they meant to vote for? Look, if you put a small dot in the corner, then fill in another, it means you’re voting for the full fill-in. Duh! As for the others, CALL THEM ON THE TELEPHONE AND ASK THEM!!! Duh! OR Show up at their house with their ballot and ask them!!!! Duh!!! Electronic systems have already been shown to be unreliable due to the fact that you can’t account, recount, or even reprint the votes. If you’re going to do a recount…do a real recount. ASK them who they were trying to vote for!!!! Here’s another idea you jackasses…Why don’t you get your high school principal to ask these retards to confirm their vote before they throw it into the optiscan? Or my mom…I mean, come on, there has to be someone trustworthy in every precinct in your state for crying out loud. Have that dude or dudette sit in front of the optiscan and ask these dumbasses who they are really tring to vote for. SERIOUSLY PEOPLE, get it together…it can’t be that hard. OR SHOW UP AT THEIR HOUSE WITH THE BALLOT AND HAVE THEM CONFIRM WHO THEY WERE TRYING TO VOTE FOR!!!!!!!!!! Someone up-thread said that when they requested a new ballot, that the spoiled one was put in an envelope. Oh wow! I wonder what happens to those? Are they then marked “Void”? Were we looking at some of them in this little on-line poll? Why aren’t they shredded on the spot? Does make one wonder. Paper ballots that the voter runs under a scanner which are then displayed on a screen. The voter then either pushes an “Accept” or “Reject” button. On “Accept” the results are registered and also printed on the ballot which is then zipped into the ballot box. When the voter presses the “Reject” button it’s spit back out to the voter with no vote registered. The scanner would also detect over or double votes and not let the voter select “Accept” A dialog box would pop up with the reason why and spit the ballot back out to the voter when “OK” is pressed or at a preset time delay. The voter could correct such rejected ballots or get a replacement as appropriate. The beauty of the scheme is that voters have to approve the interpretation of the scanner which is verifiable via the printed record on the ballot. In my precient the democrat who was programming all the cards for electronic ballots was programming republican ones as federal-only ballots. Since my wife and I didn’t realize what was going on until after we had completed our ballot, we were not allowed to vote in any state or local races. My father (who went earlier) caught on to what he was doing and made him fix it before he completed his ballot. It wasn’t happening to everybody, just republicans. I’ll NEVER vote by electronic ballot again, if I make a mistake on my paper ballot, that’s my fault, but I don’t like being defrauded of my vote by some poll worker. I work as an election judge in my county and town. I believe a paper receipt should be involved in electronic voting. Sure it is a bit more work but it also is a very effective tool as is being proved in this recount. As for asking for a new ballot..no big deal….sure even at the busiest times 2 or 3 seconds will not slow up the voting process or procedures. We work with a full staff of election judges and a head judge to oversee everything. The head judge can deal with this request for a new ballot in about 15 seconds or so figured from when voter asks for a new one. And this is just the type of scenario judges are trained to deal with in our classes we take pre election every year. These don’t help or hurt the case for electronic voting. Voting is not just a right, it’s a responsibility. If you take that responsibility seriously, you can probably figure out a way to follow the instructions so your vote actually counts. If you have any questions about the process, they have real live people at the polls who can help you. As taxpayers, you pay for that service. Be responsible and use it. These make the case for abolishing the idiotic voter intent laws and enforcing the requirements that people who vote actually do what is required to vote. Come on, folks, all you have to do is take out your number 2 pencil and fill in a bubble. We should never vote on machines that can’t be verified. We shouldn’t even count our votes on such machines. If the manufactures of voting machines are not willing to release the code to analysts, then the government bodies should move on to a manufacture who will release the code. And even having the code to how the machines work doesn’t do away with the ability to hack the code to throw an election. Canada went to electronic voting machines for one election. They quickly saw the problems they could create and went back to paper ballots. The vote counting machines used in MN had been tested and proven to be very prone to errors. The people testing ran the same set of ballots through the machines multiple times and each time they came up with a different tally. Thomm Hartman says something about “the day we privatize our vote is the day we begin to lose democracy”. I totally agree with him. What these ballots do NOT make a case for is the use of electronic voting machines—even if the voting machines provide a paper audit trail. Scannable ballots can be re-examined by human beings and provide the best audit trail available with today’s technology. What these ballots DO make a case for is better voting instructions. Voters should clearly understand that if they spoil a ballot in any fashion, they should return to the poll worker and exchange the spoiled ballot for a new, blank ballot. The poll worker should destroy the spoiled ballot. This cannot be emphasized too much when poll workers give instructions to voters: the ballot is not final until it is turned in as final to the poll worker. Mistakes are not permanent until the voter turns n the ballot. Easily solved: Voters cast their ballots on conventional, garden-variety PC’s, programmed only to reject overvotes. When the voter is finished, the PC prints out a scannable ballot, and the voter’s inputted choices are immediately erased. Then the voter reviews (but cannot mark) the printed ballot; if acceptable to the voter, it becomes the official ballot and is forwarded to the scanner. Should the voter change his or her mind, the ballot is shredded, and the voter revotes. The scanners should be hard-wired, not programmable. Computer efficiency, with a paper trail and little room for cheating, confusion or misconstrual. Little room either for Diebold-like corporate shenanigans. The comment just above starting with “Easily solved” is good. BTW my comment has no name as well, I just used two spaces. That’s why we don’t 100% trust computers. There is absolutely no way to prevent e-vote machines from being hacked. None. The same goes for e-vote counting machines. Even an amateur hacker can hack these machines and leave absolutely no evidence of hacking. Even if the Minn. Senate vote comes down to a few truly ambiguous ballots, you will at least know that that’s what it came down to. But no way exists to know if a secret ballot done or counted on a vote computer is valid. Ever. Vote by paper and count by hand – democracy is hard, but it shouldn’t be impossible. I was an election observer in Ohio. We had similar optical-scan ballots. As in Minnesota, each voter had to feed his/her ballot through the scanner, which would automatically check for over-votes. It was definitely worth it, despite the number of people who were annoyed that they had to cast a new ballot. Good points have been made, though, about the fact that absentee ballots don’t go through this validation process in a way that allows the voter to re-vote. Nor do provisional ballots in OH. They are filed separately and only counted after validation. As has been evidenced by many precincts outside of Minnesota, electronic voting machines also have the ability for error. If one cannot present intent on a paper ballot, or at least have the wherewithal to get a new ballot when a mistake is made, it is possible that electronic voting may only increase confusion. But!–If an electronic voting machine were introduced that printed out a receipt that the voter was to verify visually and then re-insert, and have that receipt be the counted vote, then this would be a step in a positive direction. Actually, it is 0.0489 percent not 0.0487 percent. Not that it is a significant difference but still inaccurate, slightly. I agree with the 2 scanners per precinct plan. One scanner for ballot verification and a second scanner for counting. This would also solve the early voting unscanned, unverified ballot errors. Early voters would have a chance to check their ballot and yet it would not be counted until all verification of identity is complete. In Ohio a voter is allowed 3 replacement ballots for a spoiled ballot (over voted or extraneous marks). I did read all the comments, and boy was I surprised to find out about the AutoMark machines. These machines are the perfect complement to our paper balloting system. After the presidential race tomfoolery in 2000, I went looking on the Internet to see what electronic voting was all about, and what ideas might be out there. I found Open Source Voting. Open Source Voting is very like our AutoMark system, only it uses a standard PC, printer, and free software, and costs are far lower. The voter chooses their votes, the computer prints the ballot, the voter verifies it and passes it to the electronic counting machine. The advantage is that the computers can print a bar code on the ballot, allowing for a second way to electronically count the ballots. Another bar code contains a secret unique to the precinct, making it possible to tell if ballots were added after the election. Open Source Voting is not perfect yet, but like many open source projects, it is catching on and improving. Over time, I believe this is the way to add electronics to our system. All the computer does is help the voter print their ballot. I’m very impressed with our state’s voting system, and with what I hear from the actual poll workers experiences. I also hear some of the rabble-rousers and partisan voices here and elsewhere. Thankfully we can all now move ahead with a new politics that values ideas and change. They will find they have nothing to fear. We should go to a full hand count-only system within full view of the public BEFORE ballots leave the precinct. The potential for electronic tampering with machines is too great. I’m a political worker in the UK and I’m suprised about how intolerant a lot of the posters on this forum seem to be about people who vote in unconventional ways. In British elections – which are conducted almostly entirely with hand-counted paper ballots – there is a long-established tradition of counting ballots by looking at what the voter’s intent is and there are some pretty established precedents for working that out. Yes people sometimes vote in unconventional ways. They accidentally tick the wrong box and cross it out. They may put a tick or a scribble where they are supposed to put a cross. They might even feel a desire to draw a smiley face in the box – and all of these types of voting have been held as valid in UK elections. The simple fact is that not everyone is as educated, or as good at understanding instructions, as the average politician or the average election administrator. But that does not deny them the right to vote. Democracy is by definition “the people’s will”. If the intent of the voter is clear – whether it be adminstratively convenient or not – you count the vote. 1) Paper Paper PAPER! We must have paper ballots for recount and verification purposes. (Just think about how many computer systems are compromised by hackers every single day). We need to have a system that accommodates this variable. Will I get to disassemble the electronic voting machine in my precinct, test the hardware on that particular machine to make sure it hasn’t been compromised. Will I get to see the source code and compare it to the machine code running in the machine? No? I guess I’ll pass on electronic voting. Are people around me complaining their names are missing from the big book of registered voters? No. Are the election judges making cryptic notes about who is voting and when? No. Does the optical scan machine make strange sounds that might mean it’s shreading my ballot and helpfully printing a new one in my name? No. Where I voted there were probably 20 people filling out their ballots at the same time as me. A few were in the privacy booths. Others were leaning up against a wall while filling in the circles. I sat in a corner and used the floor. Electronic voting machines don’t scale up nicely like this. There was even a machine to help the blind fill out a ballot there. It sat unused at the end of one of the tables. If you think there’s a chance you’ll mess up your vote using a pen, ask to use the machine. Problem solved. Do you know they have been using electronic voting machines in India since 1976! 1976! In a country with a populations so much larger than the U.S. Even in villages with no electricity. They bring in generators for the machines so people can vote. The key is their electronic voting machines are VERY simple. Much like calculators and adding machines of the time. It’s really hard to mess them up. The problem is we are so paranoid and would make our machines too complicated and try to do too much. The more complicated you make them, the more things can go wrong. This problem says nothing about preferring paper ballots over any other system. The election system should actually acknowledge simple truths of statistics and sampling: Hold the election again in cases like this. The margin of error in this election is too close to the difference in votes. I think the horrible votes, crossouts, multiple entries cry out for electronic voting. Even when the instructions clearly state to ask for another ballot, people still do those things. However have you seen electronic voting? I saw a photo of one in Indiana where there were some problems. The names and boxes to hit on the touchscreen were so small it was ridiculous. The story was about how the confirmation screens kept showing the wrong name, and the users had to keep going back to try to press the correct one again. Pardon my vitriol, but how on earth could this make the case for electronic voting? Minnesota’s system already gives the ease and overall accuracy of an electronic vote through the optical scanning system. However, at least in these cases where a voter’s intent is less-than-clear, there is evidence to be examined! With electronic voting, how do you examine intent? I’m a technophile — that is, I love all things technological (and my career is in information technology) — but I think electronic voting machines cause far more problems than they solve. The integrity and accuracy of the democratic process is far more important than the ease or speed of it. *If* we move to electronic voting machines, they *must* have a *voter-verifiable* paper trail for the purposes of detecting potential compromises of the machine. I don’t think that electronic voting will help. If people can’t figure out how to fill in a circle, do you think that they’ll be able to figure out electronic voting? We should go back to the votomatic ballot. As long as people follow the rules, this method is the most reliable. We never should have discarded it in the first place. The ballots neither make a case for nor against electronic voting. I propose that the Minnesota Legislature should establish a law, requiring the state election commission to produce a thirty-minute voter education video, and require all local broadcast affiliates and television service providers in Minnesota to donate four prime-time, half-hour blocks, during the week prior to each and every election, to air the video. The video should contain proper voting instructions for paper ballots, and use these and other examples of what the consequences of erroneous and fraudulent voting can be. In Maine, municipalities that use voting machines do have a paper ballot that is fed through the machine. We have a provision for over votes. If the scanner detects more than the allowed amount of ovals are filled in, it rejects the ballot. The voter is informed of the problem and is asked if they would like a new ballot or to “cast as is”. 99% of all voters will ask for a new ballot. We also post how to fill in the ballot on the wall outside the guardrail, in the booths, as well as on the ballot itself. How nice it would be if we all could vote as Dixville Notch does; no scanner, just a lockbox. It also would be nice to have 100% turnout like they did on 11/4. The rules are posted, voters should know what they can and cannot do. Take your time; voting is an important responsibility and it should not be taken lightly. Fellow voters generally are going to be patient and not rush you (“Minnesota Nice”)! Having said that, if one is going to vote, one should have already mastered what everyone learns by first grade: how to read and follow directions. There was one ballot on the site that stood out; it looked like someone had filled in their choice, but due to a shaky hand, put a few marks outside the oval. Could this perhaps have been made by someone with a neurological ailment, such as Parkinson’s, or another physical ailment with the shaking as a side effect? Is there any kind of assistance offered to such people, either by an election worker or voting mechanism alternative? These votes are not an argument for electronic voting. I was an election official in rural Arkansas this summer, and believe me, if people screw up paper ballots, they will screw up electronic ballots. The ballots shown in the article above are an argument for literacy tests to qualify citizens to vote. If you can’t read the instructions (or are too stupid to remember to read them), you shouldn’t get a say in our fine system. Democracy is a responsibility, not a right. I’m a voter from Florida. After the joke of the 2000 election I thought we got it right with the computerized voting booth. It was easy, it gave clear feedback, and allowed quick totals. But the State Party (the Republican) thought it was too easy to fix (or too hard for them to fix) and they went to file in the dots ballots hoping to win another Presidential election for the Republicans. Interesting the Presidential primaries still used the computerized booths. The only test of the file in the dot system was for some minor local primaries less than a month before the General election. Most poll workers hated the new system and said all they had to do was put the option printer on the computerized booths. There should be one standard method of voting nationwide for the Presidential election not controlled by any particular party and should some sort of electronic system with paper receipts. Literacy tests? I hope you’re joking, Jacob. How about a constitution test? Or a faith a values test? Do you get to write the test or do I? I think you’d fail the constitution test since democracy is one of the inalienable rights we are born with that our government can’t take away. It does not matter which method to use; there will always be mistakes in voting. With electronic voting, you may be able to eliminate ambiguous ballots because when you trigger the mechanism (touch screen, switch, whatever), result is either for one candidate or the other, but is that actually the candidate you intended to vote for? In any case, a few hundred votes out of millions mean nothing but a tie. Try to count a couple million toothpicks a few times and see if you can come within a couple hundred between the counts. If the state were to recount the recount, I bet that we would get yet another set of numbers. Therefore, giving the win to the person who is ahead is arbitrary but as good as any other method, including recounts. It give me no pleasure at all that this would mean Coleman wins, but given that it is a tie, it is meaningless to argue who won. Tossing a coin may be satisfying to some, but if you think about it, the result would not be any more or less meaningful than than just calling the person having the lead the winner. The only exception I would make to my proposed law would be if fraud or mistakes of a scale large enough to make a statistical difference could be proven by some very high (e.g., clear and convincing) standard. MV7, in that little sentence of yours, “If you cant do it, you should be able to vote period.” there were at least three errors: two missing punctuation marks and, more importantly, the word “not”. Your intent in making that statement is therefore totally negated by what it actually says. Want to rethink whether people who can’t handle filling the bubbles should or shoult NOT be able to vote, period? The bubble system is designed to compensate for machines’ inability to read handwritten notations. I think we either need to come up with better technologies to decern voter intent, or tolerate mistakes like these. Out of millions of ballots, even a couple of thousand mishandled ballots only amounts to about one percent, which is not bad. It makes the case for a better education system. WHy can’t people follow simple instructions? It’s my understanding that in Canada in 2000, while Americans were arguing about hanging chads and butterfly ballots in Florida, Canada had an election for prime minister in which some 10 million ballots (admittedly, a much smaller number than that cast in some states) were marked by hand and counted, again by hand, in about four hours. With proper auditing and supervision, we should do likewise here. The slight amount of extra time involved would quickly be offset by the extra amounts of time and energy that wouldn’t be needed for days or even weeks of senseless recounts. The system wasn’t broke until voting machines, optical scanners, and the like were brought in. Mark ’em and count ’em by hand. Why does the Secretary of State’s website list both Franken and Coleman with a pre-recount total of about 1,040,000 when all the national media results I have heard put them around 1,211,000? I think that these issues do not make any case with regards to electronic voting. The only case it makes is that we need some short video playing at the voting center that details the proper way to fill out the ballot. This is the way everybody has completed standardized test all through elementary and secondary school. So a short 3 minute video on a loop at the polling station should be a sufficient reminder. If you make a mistake get another ballot or you run the risk of your vote not counting. They could also provide a white marker for people to white out any mistakes. Forget electronic voting, it’s obvious that the only trustworthy way to make sure everyone’s vote counts is to allow the Lizard People to run the polling stations. Why didn’t these people get a pencil with an eraser? We can’t determine whether mistakes are made from general stupidity, or a problem with motor skills, visual deficiency, or some other cognitive issue like dyslexia. And no matter how helpful and pressure-free we try to make the polling place, some people will suffer embarrassment or panic in certain situations, regardless. I am pretty sure electronic voting would result in more errors, and even more failures to correct those errors. However, I am not intimately familiar with the electronic voting system. The majority of our population probably still can’t program their VCR, even though it’s already “obsolete.” Perhaps the obsolescence of pen and paper should wait. Electronic tabulation is still used to expedite the process. It’s efficient enough. There are far greater problems with government that need streamlining first. Of course this life and government is obviously just an experiment in public opinion. So there’s mine. Um, so the machine can provide a hard copy of its algorithmic lie? Good Lord. Minnesotans make Floridians look like mensa members. Al Frankin? Really? Can what is with the morons who can’t blacken a bubble? These people clearly should not be voting. Bring on the electronic ballots where you can blame the software and help the voters protect themselves from their own ineptitude. The ballots are 1)too confusing, 2) too fine print 3)the pencils do not erase well (made in China) 4) Rules should be reviewed VERBALLY and lots of volunteers should be available for disabled–which include blind, going blind, elderly, handicapped, illiterate & anyone who needs help—I am a soical worker & am astounded at how difficult paperwork is for the average AMERICAN—-purposefully difficult—this is an easy fix with the size of our population. …get teens involved!! !Paper receipts and electronic tabulating is vital. TWO reciepts are needed. one for the board that reviews questionable ballots & one for the voter—so if that ballot is called up in question—some ONE contacts that person & reviews it PERSONALLY–just like in banking–when the bank balance & the owners balance is in discrepancy–the account holder is called into question.—and I am assuming the voter is alive—I hate to see/hear dead people still voting!! Fingerprints are everywhere and are not “identifyable” marks–not intentionally. We all leave ID marks on toilet seats–but please dont take that into consideration.–just a thought. The “problem” is a very small percentage—way less than medical errors and deaths—it is worth addressing. Is this recount, or is this recount not the exact reason we NEED paper ballots? While some say intent is the variable, we have election officials/judges that should be exacting in their interpretation of a ballot but err on inclusion. The intent of a voter is difficult to discern, however looking at these challenges, it isn’t the errant mark that should come to question. The additional mark was a leaking pen, an intended cross out, a person accidentally making a mark. I believe it is both candidates duties as our (potential) representative to attempt to make every possible ballot count and allow the count to stand including absentee ballots. It shouldn’t be a candidate speculating the results to state inclusion/exclusion. What happens at the end of this when it’s a dead heat? Wow, these ballots were a bit ridiculous. How difficult is it to fill in a bubble, or know which candidate you want to vote for before you get the ticket? No, they make the case for an IQ test prior to voting. If a person doesn’t take it seriously enough to think before marking, how can we trust their judgment in who should represent not only themselves but the rest of their community?